I was watching (or should I say re-watching) the "Hi, Society" episode of Gossip Girl, the one with the debutante ball...and spotted a new, very cute detail. 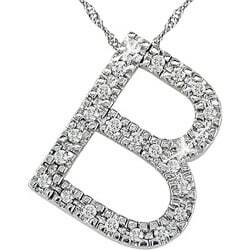 The beautiful Blair Waldorf was wearing diamond encrusted white gold initials on a necklace during the scene where she is talking to the NYT writer. She had a "B" and a "W" in block capitals. Overstock.com has an exact match for this fabulous necklace, surely at a fraction of the cost. Personally, I am a little more into the swirly, script initials...and may just purchase an "S" for myself in the near future. Love your blog and all the Golightlyness of it all ! Merci ! Great match. Great find. Thanks. P.S. I noticed we are off the blogroll? Any probs?